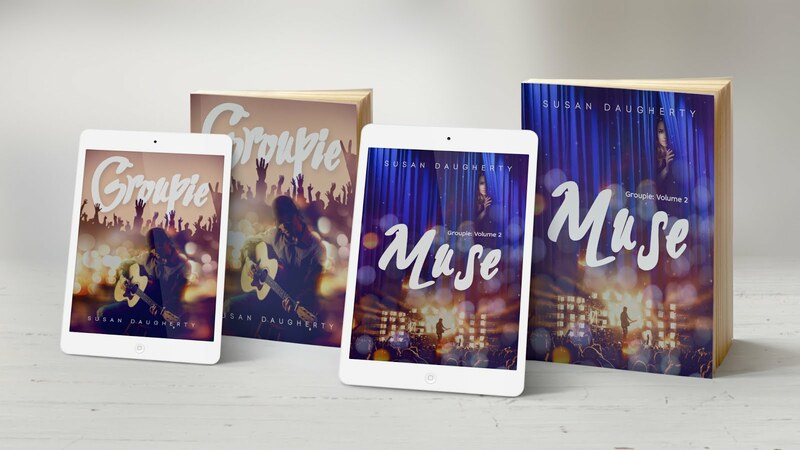 Susan's Sanctuary for Readers: GROUPIE BOOK CLUB QUESTIONS! I'm very excited to release these questions to guide book club's through discussions of my novel! I have attended as the guest author at some amazing book clubs and had so much fun! 1.The quote from the Morrisons plays an important role. "The secret is not finding the perfect someone you can live with, it is finding the imperfect one you cannot live without." Do you believe in this quote yourself? How do you feel it affected Lexie throughout the book? 2. Lexie judges Jack by his image as a celebrity. We know this is often the work of tabloids, gossip, PR stunts and image creation for Hollywood. It is also widely accepted that celebrity comes with a price. Do you have these pre-conceived notions of some celebrities and it is fair for Lexie to have judged him? 3.The author considers the soundtrack to this novel to be a very important layer to the story. Did you identify with the music and what role did it play for you and the emotions of the novel? 4 .As readers learn more about Lexie's past with her parents and boyfriends, how did you think these experiences shaped her views on love and commitment? 5.The author found the Ashley's character essential to the novel. Did you connect with the best friend and why do you think her role was vital? 6.The author's desired to keep the sexual scenes in this book at a 'sweet' level- did the book succeed in giving romance, angst and butterflies without being explicit? 7.The supporting cast brought a variety of personality to the novel. Some were friend and some were foe. Who stood out to you and why? 8.What as your favorite scene in the book? 9. What was your favorite line in the book? 10.Lexie's underlying issue is lack of self esteem and her loss of confidenceafter the alterations in her life. This makes her feel unworthy of Jack andlove in general. Do you think most girls can identify with this at someage/stage of their life? How can it cause a ripple effect in their choices? 11. At the end of Volume One, Lexie has made a decision to choose work/career over a relationship. Is it a valid problem for women today? Did she just use this as an excuse to end things before she got hurt or did she truly feel she had no choice? 12. Jack retaliated to hurt Lexie after she ended their romance. Who was most at fault?If you were in each person's shoes, could you forgive? 1. Lexie admits to having done the opposite of this quote… she was looking for perfection and if there was any noticeable flaw, she was running away from any date. Her expectations were impossible to meet, yet she wondered why she was having a hard time dating. This quote from a couple who had made it through so many years together really opened her eyes that it was okay to have flaws but to find the one your heart truly wanted. 2. Lexie’s anthem could have been Maddie and Tae’s song “Girl in a Country Song.” She was personally offended by the turn of country music into the Bro Country era. She took this out on Jack, as the most shining example of what she felt was degrading treatment of women. I do think the public tends to put celebrities in a box to label and can be harsh to judge every word they say or outfit they wear. I do also think they sign up for this and must get used it as they seek stardom and the money that comes with it. While I don’t envy them the scrutiny, there’s no real way to avoid it! 3. The music honestly shaped the book as I thought of songs I wanted to used in different scenes throughout the book. I knew that each one would have a special part and the novel was partly shaped around these songs. They speak the emotion of the time or provide a means for Jack to show Lexie that she is inspiring change in him! 4. Ashley was the best friend we all need! She provides levity and comic relief. I think she was important to give Lexie the sounding board she needed to work through her emotions. Ashley was also there to say what the reader is thinking in their head… like, ‘are you crazy, you can’t turn this down’ and ‘this is not a BAD problem to have!’ While Lexie is cautious, Ashley gives the positive light and encouragement needed. 5. Lexie started with the dream of a soul mate and perfect marriage. When she was hit with several major let downs from those she loved most, she felt like it had all been an illusion and that she was better off to be realistic. If her parents couldn’t stick to their vows and her boyfriends showed only cheating and using her, she felt the dream slip away and decided to hide behind a wall of caution. I think its very much believable that this can happen to a young woman and that she uses defense to keep anyone away who could hurt her again. 6. I wanted my teenage niece and my ninety year old grandma to be able to read this novel! I tried to convey all the delicious tension and sweet romance to give chill bumps and butterflies and then let the readers mind do the rest! 7. Some choices would be: Andy, Kate, Charlie, Ric, Trina, Fitch, Lee, Gloria. I adored Charlie the most! The unapologetically country to the bone Uncle with a great sense of humor and the immediate affection for Lexie. Supporting cast villains include Amos and Delilah- which are always fun to write as we need someone to hate! 8. I had so many! I love when she accidentally eavesdropped on Jack talking to Amos and got busted by dropping the cups. I adored the scene when they danced to Wonderful Tonight. Her birthday was hard to beat because who doesn’t want a day (and night) like that?! I also love when she is first meeting to join the tour and realizes she riding on Jack’s bus. The repetitive scene of good luck kisses before the shows always makes me smile, too. 10. I really wanted to address this issue of self esteem for girls of this age. I think it can really make or break your future when you don’t feel worthy of love or success or are just too scared to put yourself out there as a young woman. I know I made many mistakes in my youth that I can clearly attribute to lack of confidence at certain ages or maybe just in specific situations. I hope Lexie’s journey will help other girls see they are not alone and you can move past to grow and become who you want to be! 11.This is a tricky question that I shall answer with one word. Both. She truly did value her career and had big dreams of success that she felt needed to come first. However, her career was so important to her because she was afraid of love and therefore, threw all her hopes and goals into work. So, in choosing her career, she was also giving into her need to protect herself from hurt. Quite honestly, she was well outside of the acceptable lines of patient relationship and her boss was not understating the trouble she could be in! 12. This continues to be a circular question… she hurt him first with a questionably bad decision. He feels the need to strike back because he is angry and heartbroken. His indiscretion, in my eyes, was MUCH worse than hers. She did have very valid life decisions to make (but should have talked to him about it and not been rash and so easily dismissive) and thought she didn’t have much of a choice. His was terrible because it validated every fear she had and she had to see it with her own eyes. However, one can argue that his retaliation would never have happened if she had just handled her situation better in the first place. She truly hurt him and set the ball in motion. Therefore, I think they are both to blame. As far as forgiveness, it is much easier to forgive what she did because it was not physical and her choice could have been reversed and she could have explained her fears and confessed she was wrong and changed her mind to bring them potentially closer together. His physical cheating can’t be undone and though driven by hurt, was much more unacceptable. Though both would have to build trust back again, I do think the fact that he’s the primary one begging forgiveness is natural. academic writers try essay helper. The value of this way is that I get a good score every time when I pass such work in college. In this way, I take free time in the schedule for golf, trips and reading books sometimes. And I was truly glad to read your post, thanks! I like to read books very much. Each book is a separate story with own original characters, events, experiences, emotions. Reading doesn't bother, but on the contrary it attracts more and more. I'm writing a review, you can learn even more. It is necessary to read everything, it develops the vocabulary and expands the imagination. Hi! Thanks for nice topic to discuss! I love to read very much! But sometimes, when I have a lot of tasks and no time, I visit website for a help. I'm curious whether you have ever applied to such sites too? Or where you take your inspiration to read and write more?